50% of companies surveyed plan to increase U.S.-based production jobs by at least 5% in the next five years. Nearly 25% of companies plan to grow more than 10% in the next five years. 80% of manufacturers report a moderate or serious shortage of qualified applicants for skilled and highly skilled production positions. More than 70% of manufacturers report at least a 5% increase in overtime costs and nearly one-third report a greater than 10% increase in overtime costs. Nearly two-thirds of manufacturers report at least a 5% increase in production downtime and production cycle time. 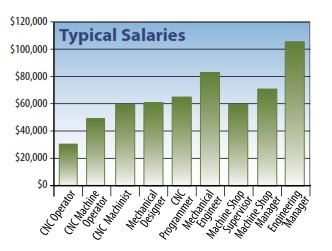 The total cost to manufacturers of skills shortages are up to 11% of net earnings. Manufacturers invest approximately $3,000 in training for each new hire. Manufacturers spend approximately $1,500 per employee in training each year. *Information from Accenture's 2014 Manufacturing and Training Study. See full report. Many machinists eventually own their own shops. The typical shop brings in sales of $2 million per year and was founded by a 35-year-old machinist. The graph below reflects wages as one progresses through their career. Entry-level no set-up skills, hired out of high school machine shop programs or basic community programs. Intermediate set-up skills (basic to moderately complex set-up skills). Moderately complex to complex set-up skills. Ten plus years hands-on experience. Uses modeling software, such as Solid Works to develop blue print drawings from engineering design concepts. Programs CNC machines. Utilizes programming software such as MasterCam, Gibbs and Espirit, to name a few. Develops design concepts, ensures their manufacturability and may develop their own blue print drawings and job packages. Typically has 15 plus years hands-on experience. Has overall responsibility for the Machine Shop in addition to pricing and quoting jobs to customers.